There’s a new Harris Tweed producer. 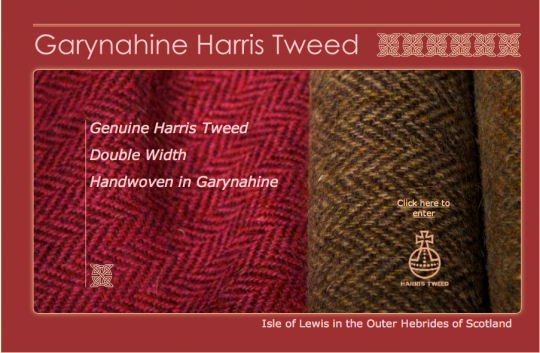 Garynahine Harris Tweed is based in the Outer Hebrides of Scotland and run by crofter and weaver John R MacLean. This is the real stuff, handcrafted, protected by an act of Parliment, dyed at local mills in colours that reflect the surroundings. It’s fall. It’s time to think tweed. This entry was posted in Cultivating and tagged Garynahine Harris Tweed. Bookmark the permalink. I had the pleasure of meeting Mr. MacLean while in Lewis/Harris last month and even doing a tiny bit of weaving with him. His tweed is beautiful, and the industry needs to be celebrated and promoted so yes, do spread the word! (Pictures here: http://cornflower.typepad.com/domestic_arts_blog/2009/08/harris-tweed-1.html and subsequent posts, should you wish to see them). As an artist I love that red toned tweed. I know they are all wonderful….I would love to be able to tour the mill….have not been to Scotland. Artisanal tweeds from the United Kingdom are beautiful. The tapestry like effect of different coloured yarns, the limited production, the incredible durabilty, and the classic style make them unsung heroes of the textile industry. Chanel built an empire on tweed. Don’t pay thousands for the designer versions…go straight to the source, choose your own pattern, colour, and have them made up in your favourite silhouette. Harris tweeds are as serviceable as denim, but have an unmistakeable distinction and charm that enhances the style of the wearer. One of my favourite jackets is dark blue herringbone Harris tweed. I wear it like a blazer, but it has a different versatility. I think I’m right in saying that furth of the British Isles you won’t have access to BBC iPlayer, but if you can get it you may like to watch an excellent recently broadcast series on Harris tweed, the first of which is here: http://www.bbc.co.uk/iplayer/episode/b00ml5nv/Tweed_Trouble_Looms/. You could, of course, go to Patrick Grant at Norton & Sons of Savile Row – http://www.nortonandsons.co.uk/ – a buyer of the tweed and a bespoke tailor, and have him take care of any sartorial requirements for you. (And no, I am not connected in any way other than pure interest in the subject!). One of the many delights of Scotland! Nothing like it in the world.